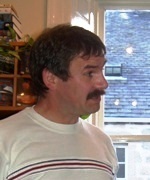 Poet Douglas W. Gray launched his new collection Lubrication at a New Words / New Sounds event presented in Pennan Village Hall during Wordfringe 2009 in association with the Sound Festival. 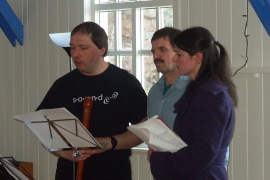 He was joined in a mixture of words and improvised music by Catriona Yule and Haworth Hodgkinson, two of the founder members of the Blue Salt Collective. I was last in Pennan Hall two years ago. The following day part of the cliffs that loom over Pennan fell on top of the Hall. I thought of that this Sunday when I was back in Pennan. However I am happy to report that I was successfully distracted from thoughts of imminent death. Doug's new book Lubrication, a collection of poems of unflinching emotional depth written between 1995 and 2006, provided the core around which these three poets gave a splendid performance woven through with Haworth's incomparable music – drum, gongs, woodwinds – Doug's gritty realism and Catriona's quietly sharp observations of life. Occasionally they presented a poem together and this gave an extra dimension which worked well for the listener and for the poetry. There was never a dull moment. Our hearts and minds were stirred and even the cliff caught its breath and was still. That was fine by me. 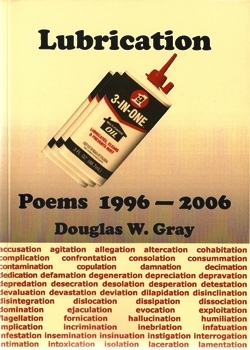 Douglas W. Gray lives in Cove Bay; founder member of the Dead Good Poets, former editor of poetry magazines Storm and Spume, published widely. Awards include: second prize in the Northwords Open Poetry Competiton 1998, first prize in the Feile Filiochta Open Poetry Competiton and the Irish Times Perpetual Trophy 2001, second place in the Scottish International Poetry Competition 2003, and winner of the Ayr 800 Open Poetry Competition 2005.